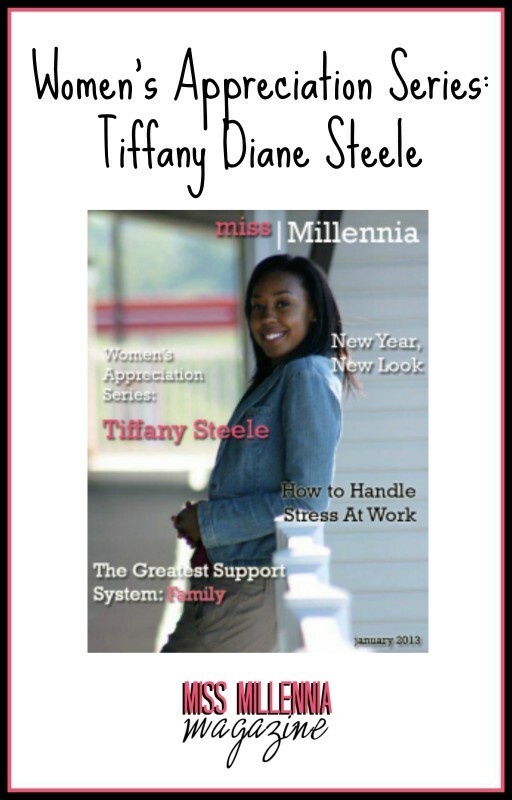 In our second installment of the Women’s Appreciation series, we would like to re-introduce Tiffany Diane Steele. Some of you may be familiar with Tiffany. If you recall, she was a Lady Lennia last May during our Giving Back edition. While Tiffany enjoys providing a helping hand to others, she is also a multi-talented artist. See what Tiffany is up to today. Lately, many professional athletes have taken their faith mainstream. As a result, they have influenced others to pursue their dream with God as their source. I mention this because I am inspired to work in the arts because of the passion that I have to perfect my God-given talent as an artist. Jeremy Lin, an NBA player, said in response to his talent in Basketball, “The biggest thing is to understand that your talent and your ability to play basketball is a gift from God. The biggest thing to understand is to use that for God’s glory…” This advice can be used in any profession, including the arts. I am proud of my lineage. I come from a family of honest, hardworking individuals that seek to live a successful life. I was raised to not despise humble or small beginnings, and to live life one day at a time, while I grow and make progress towards an attended goal. Once I accomplish these short or long term goals I gain the momentum that I need to pursue bigger dreams to leave a legacy. When thinking about a legacy I remember that a legacy can be good or bad. Therefore, I always try to leave any assignment, school, workplace, church, or gathering with a positive reputation. With that being said, I can say that I am proud to be Tiffany Diane Steele. The first person to come to mind is my oldest brother, Ray Steele III. He instilled the values of completion and hard work by forcing me to practice day and night even when I wanted to give up. Today, I work as a college completion coach at Owens Community College. It is my job to counsel and encourage first year college students to complete that year successfully. I took this job because I thought it was a great opportunity to gain counseling experience since I intend to become an art therapist and counselor, but I also saw this as an opportunity to instill the value of completion into the lives of others. I am an aspiring art therapist committed to living an enriched life. I am here to empower by educating, advocating, and encouraging individuals to reach for optimal health through an integrative approach, attending to their mind, body, and spirit, by providing the resources for discipline, personal development, and overall health. This year Olympic gold medalist, Gabby Douglas, took the world by surprise with her mature character and amazing athletic abilities. Although young in years, Gabby demonstrated a wise character, as she made statements such as, “Never give up and always keep fighting, because though times may be tough, the sacrifices do pay off…” Although she spoke in regards to her struggles as a gymnast, I believe anyone can benefit from this advice. Anyone can quit, but it takes a person of commitment and dedication to continue to pursue their dream even when unexpected events occur, a pregnancy, job loss, a car accident, a death, low funds, to name a few. NEVER allow temporary setbacks to leave you permanently stagnant. If I knew that I addressed the writer with a good balance of praise as well as advice, I would allow the writer to freely address their concern but I would remain constant with my critique. If the writer is still unable to comply I would have a heart to heart to let them know the importance of accepting constructive criticism. Besides art, what do you like to do in your spare time? Based on previous responses I believe it safe to say that I love fitness and sports. Lately, I have been focusing on the importance of physical health in the grand scheme of holistic health, attending to the mind, body, and spirit. I hope that this interview demonstrates my desire and my approach to maintain holistic health by using art as a means of mental expression, fitness as a way to remain fit, and God as my source of spiritual life. What advice would you give to women interested in art and/or becoming an artist? The art industry is unpredictable so it is important to remain flexible and well rounded. At times you may find yourself working to maintain a balance between your career and personal life. Your artistic pursuits may not support you monetarily; therefore an additional stream of income is necessary. Where do you see yourself five years from now as an artist? In five years I see myself as a more advanced artist that has found her “niche.” I started off as an abstract expressionist artist but I took a two year sabbatical to redefine myself. I ask myself, “What will make me stand out from the rest?” There are so many artists with great talent which is why it is important to offer something that has not been done. I am currently working on a new genre and once it is completed the world will see. Want to learn more about Tiffany? Read some of her past blog posts.